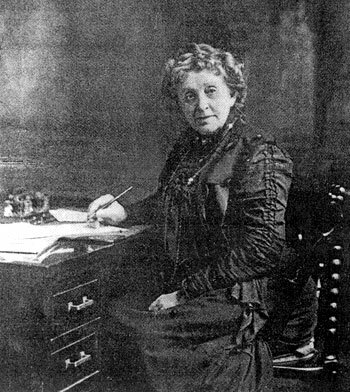 Josephine Garis Cochrane invented the first workable dishwasher. An attempt had been made before her, by a man, but it didn’t work and never got off the ground. Her father John Garis sent her to a private high school in Indiana. When that burnt down, he sent her to live with his sister in Shelbyville, Illinois and continue her education there, where she completed high school and graduated. At the age of 19, Josephine was married on 13 October 1858 to William A. Cochran (1831 – 1883), who was 27 at the time. He was a merchant and a county clerk for sixteen years, a Free Mason and a member of various Democratic Party committees. From 1853 to 1857, William had been in California trying to strike it rich in the Gold Rush, but didn’t. He’d returned back to Shelbyville and started a dry-goods store. In 1870, they moved into a large home, where Josephine was able to entertain in style, which she did frequently. Her husband died when she was 44 in 1883. After William died, she changed the spelling of her last name to Cochrane (with an “e” at the end.) It was shortly after that, while still 44, that she invented the dishwasher. She was driven both by an idea and the need for money: William had left her with a lot of debt, and only $1,535.59 in assets. And, the story goes, while she was tired of her servants chipping her heirloom china while washing it, she didn’t want to wash it herself. On paper, she came up with a design that had you put your dishes into wire compartments, then place the compartments into a wheel cage that you lowered down into a copper tub. A motor (powered by hand) pumped first jets of hot soapy water and later hot clean water over the dishes. The dishes would be left to dry from their own heat in the device, and then be ready to put away, or use again straight from the device. The first few men she tried to hire to put her design into reality insisted on mucking with her design, and the results didn’t work. Finally, she hired a man named George Butters. His full-time job was as a mechanic for the Illinois Central Railroad. Working part-time with her in her back shed, he implemented her design and fitted the finished machine into her kitchen for her. Josephine named her company Garis-Cochran, after her dad and her husband, and contracted Tait Manufacturing in Decatur, Illinois to make the first dishwashers for her, with the process being managed by Butters. In 1897, business was enough to outgrow the contracted factory and necessitate her opening her own in an abandoned schoolhouse with 3 employees overseen by Butters. She renamed the company to “Cochran’s Crescent Washing Machine Company,” and got many Shelbyville residents to invest in it. She said the hardest part of getting established was going to hotels by herself to do the sales pitches. In those days, women did not go to hotels unless accompanied by a man. Josephine displayed and demonstrated the machine herself at the Columbian Exposition in Chicago in 1893, where it was a hit and won top prize. She also sold nine of them on the spot to people who were running kitchens at the Exposition. Sales were mainly to restaurants and to hotels, but not to homes, owing to the price of $150. A few things had to change before it could break into households. In the early 1900s, most households didn’t have large enough hotwater tanks to supply a dishwasher, and many women actually enjoyed socialising with each other after a meal in the kitchen without the men while doing dishes. She managed her company until she died of a stroke in on 3 August 1913 in Chicago. She was buried in Graceland Cemetery in Shelbyville, Illinois. The rights to her dishwashing machine company were bought out by the Hobart Company in 1916; Hobart later renamed itself to KitchenAid. Her house was still standing as of 2007. “Some one has invented a dishwashing machine that is capable of washing three thousand dishes in half an hour. One special advantage of this machine is that it don’t lose any time talking in the back alley with a policeman.” — Tid-bits. Chippewa Falls Herald August 6, 1886. Page 3.